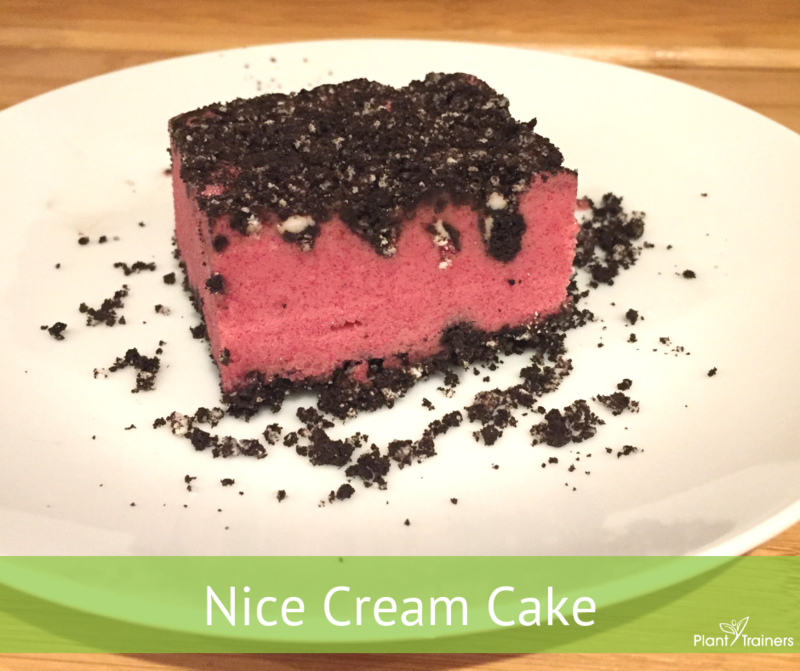 Wow, this is a delicious Nice Cream Cake that can also be used for Valentine’s Day or any time of the year! Have you been to the stores lately? How many liters of milk is going into all those chocolates? How much gelatin is being used in those candies and how much low grade processed sugar sources are being poured into molds. Probably enough to fill a football stadium. Maybe you’re going to eat some candy. Maybe your children will get some from their grandparents or maybe you’ll abstain altogether. We’re not here to judge. But we are here to give you a fun, healthy(IER) option to all this Valentine’s Day madness that is DELICIOUS!!! Oh, and the Nice Cream Cake does not have to be pink. Use berries, beet juice, spinach or any other coloured natural food dye to make the cake the colour of your choice. Cut some parchment paper so it fits the bottom of an 8×8 square pan or any shape pan you use. We use a heart. Place the mashed cookies on the parchment paper in the dish. Carefully spoon the banana mixture into the pan trying not to disturb the layer of cookies and make the top smooth. Crush the other half of the cookies in the plastic freezer baggie. Place those crumbs on top of the banana mixture and gently press down so the cookies will be stuck in the banana mixture (you can even use the side of the spoon in a slight chopping motion). Freeze the cake for at least one hour or until frozen. When you take it out, use a sharp knife to separate the cake from the sides of the dish. Put a serving plate over the top of the dish and flip it over together. It should come right out. Remove the parchment paper and serve frozen. Check out our recipe for Banana Nice Cream as well that can be used for the middle of the Nice Cream Cake! Enjoy this Nice Cream Cake!